Saturday morning my parents went to the Dachau Concentration Camp Memorial. 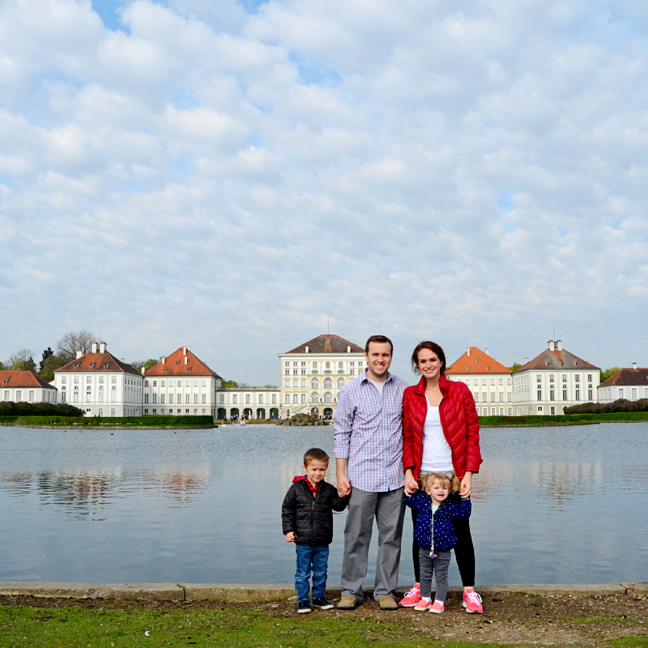 Since kids under 12 are discouraged from going, our little family decided to travel to the Nymphenburg Palace instead. And may I just say, WOW. This was my favorite activity/place in all of Munich. Sad it wasn't with my parents, but they had fun (not really the right word) at Dachau. We parked, got out of the car, and practically ran to the walkway across the water to start taking photos. Panoramic shot and I couldn't even get it all. Just to give you an idea of how MASSIVE this complex is, here is an aerial view. The buildings are all connected from one end to the other. It must be miles long! 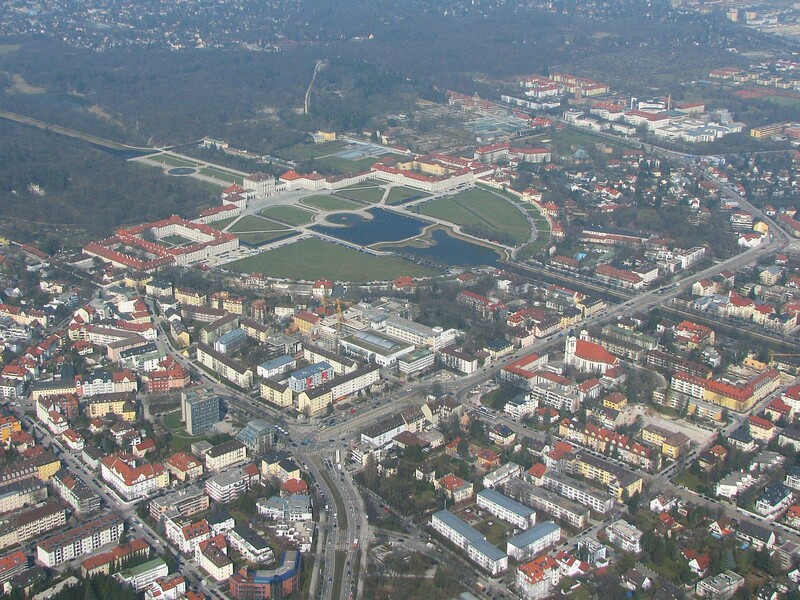 Another view from the sky. Christmas card 2014?!? The weather was so funny - sunny one minute and cloudy the next which made for different lighting and I can't decide which picture I like best. More of the palace - the ends. Just one little building is 17 times as big as our apartment! 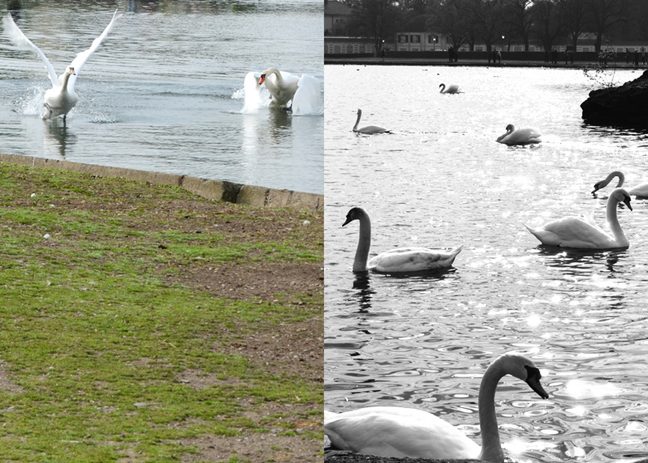 There were swans swimming freely in the lakes and ponds and rivers around the palace. MEAN swans! They were literally running across the water squawking at each other. A view back to the road from the walkway over the water. 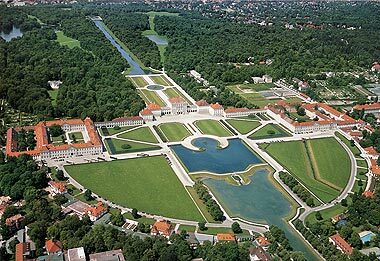 Nymphenburg Palace and the surrounding one-square-mile park are a great place for a royal stroll or discreet picnic. 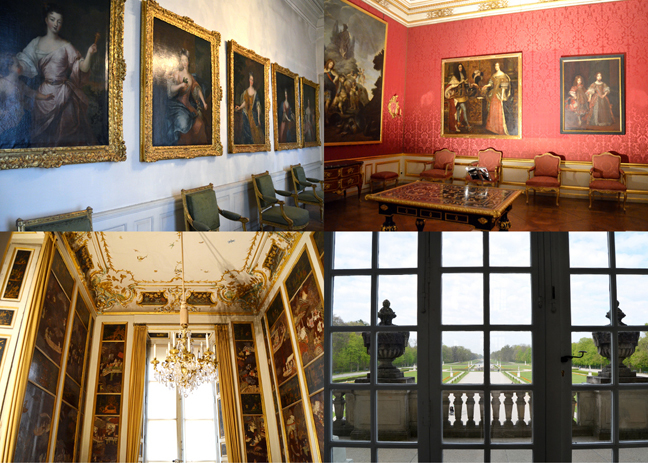 Indoors you can tour the Bavarian royal family's "summer quarters" and visit the Royal Stables Museum plus playful extras such as a hunting lodge (Amalienburg), bathhouse (Badenburg), pagoda (Pagodenburg), and artificial ruins (Magdalenenklause). In 1662, after 10 years of trying, the Bavarian ruler Ferdinand Maria and his wife Henriette Adelaide of Savoy, finally had a son, Man Emanuel. In gratitude for a mail heir, Ferdinand gave this land to his Italian wife who proceeded to build an Italian-style Baroque palace. Their son expanded the palace to today's size. 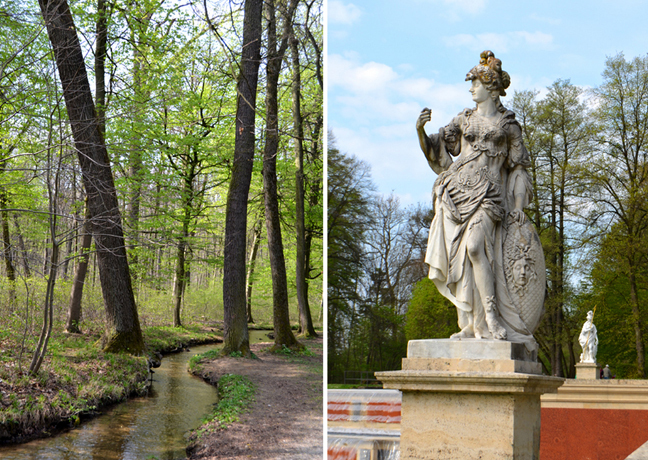 FOr 200 years this was the Wittelsbach family's summer escape from Munich. 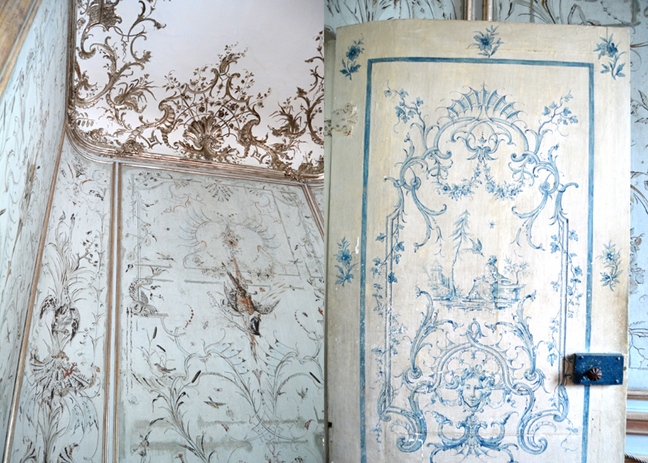 They still refer to themselves as princes and live in one wing of the palace - cool! 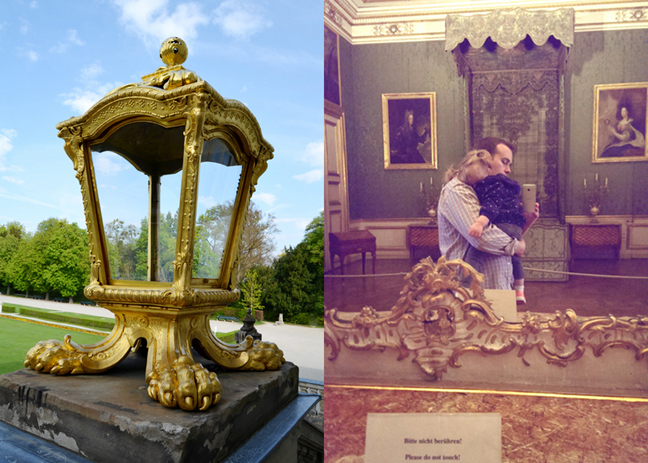 After browsing through the gift shop and looking at a little display, we went on a tour through the palace. Janey-Pie took a fall on the way in and cried herself to sleep on Chris' shoulder. As sad as it is, it made the tour so easy! She's at the stage where she RUNS when you tell her to come.. Painting of the palace. 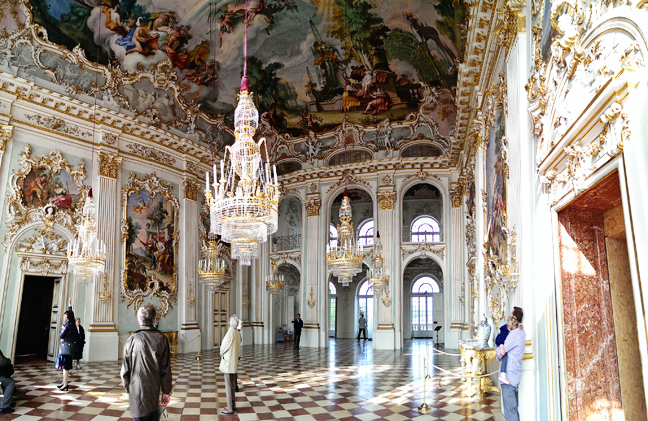 The Great Hall in the middle was the dining hall, site of big Wittelsbach family festivals. 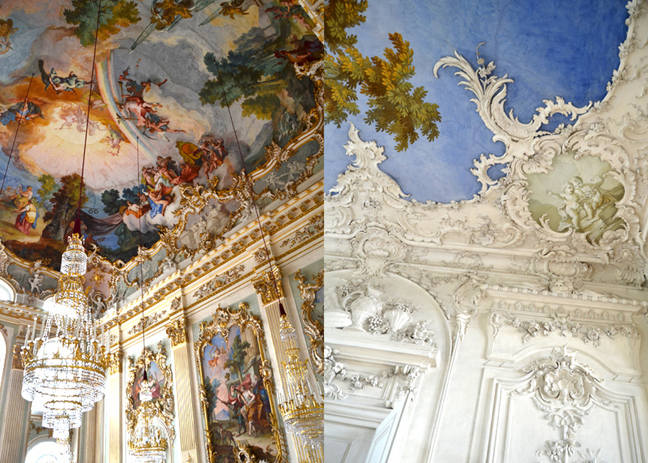 One of the grandest Rococo rooms in Bavaria, it was decorated by Johann Baptist Zimmermann (of Wieskirche fame) and François de Cuvilliés in about 1760. The painting on the ceiling shows a pagan heavenly host of Olympian gods, a scene designed to help legitimize the supposedly divine rule of the Wittelsbachs. 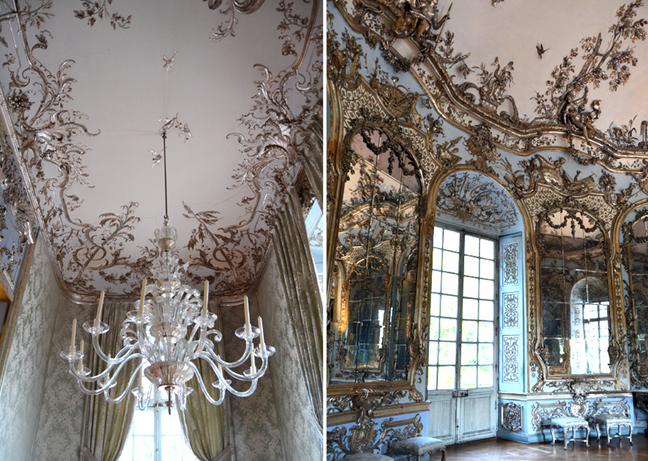 I could stare and stand in this room forever. 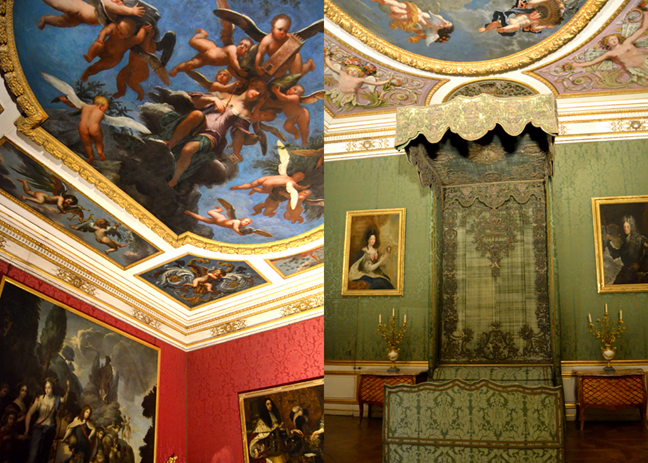 From here, the two wings (the King's and the Queen's) are mirror images of one another: antechamber, audience chamber, bedchamber, and private living quarters. 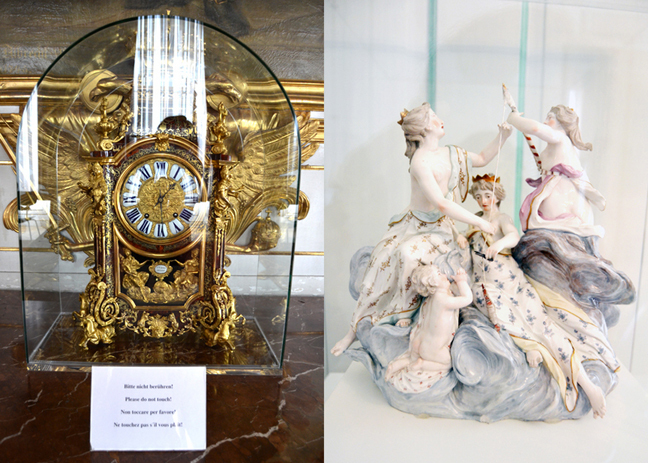 An ornate clock and pretty sculpture in the palace rooms. 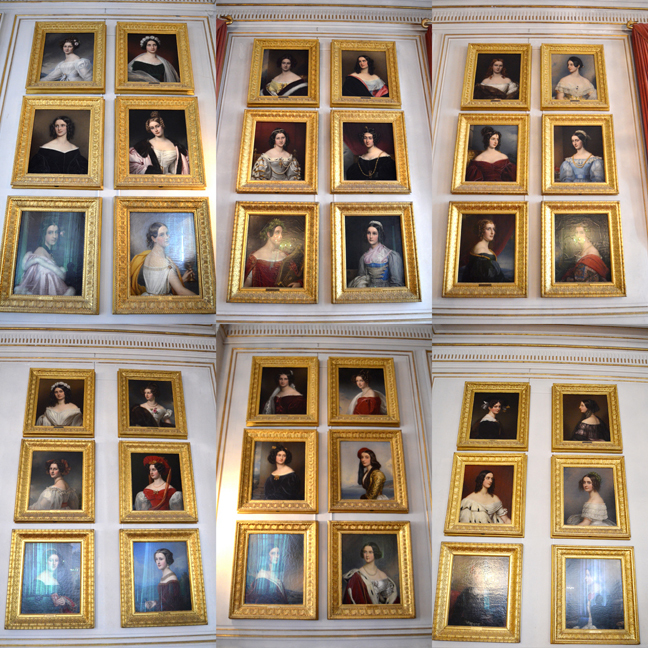 The King's Wing has walls filled with Wittelsbach portraits and stories. Imagine the logistics when the royal family - with their entourage of 200 - decided to move out to the summer palace... The Witteslbachs were high rollers - from 1624 until 1806 one of the seven electors of the Holy Roman Emperor was always a Wittelsbach. In 1806 when Napoleon put an end to the Empire, he permitted the Wittelsbachs to call themselves kings instead of just dukes, duchesses, and electors. 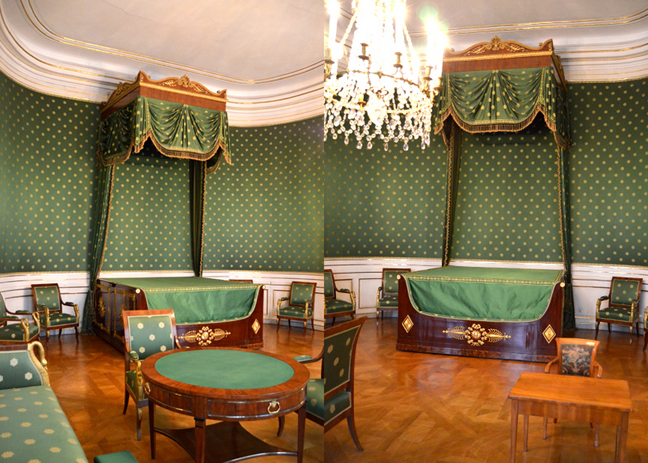 This is the room where King Ludwig II was born! So we've seen where he was born, where he lived, and where he rests in peace. Then we ventured outside to the massive grounds. The wooded and grassy knolls extend far back beyond the formal gardens and are popular with joggers and walkers - biking is not allowed. The park is laced with canals and small lakes where court guests once rode on Venetian-style gondolas. Looking back at the palace. 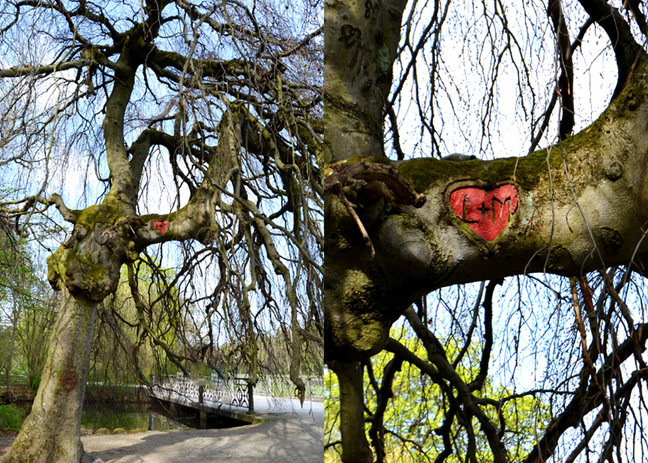 Hidden on the tree is an "L+M" carved into a tree and painted red. L+M for my cousin Maren and Logan! 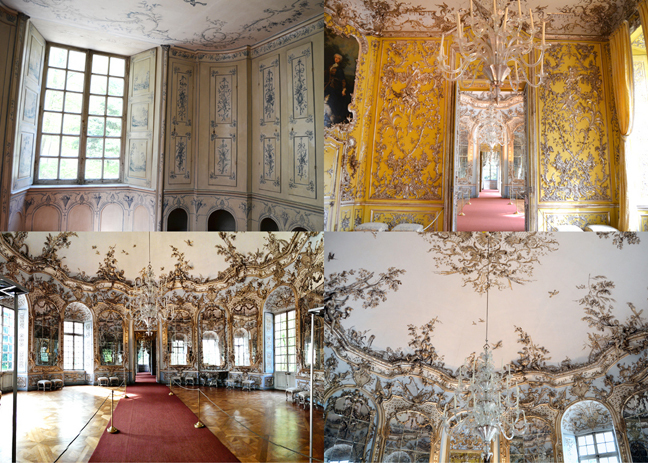 The Amalienburg - a fine little Rococo hunting lodge which takes just a few minutes to tour. And it's PINK! 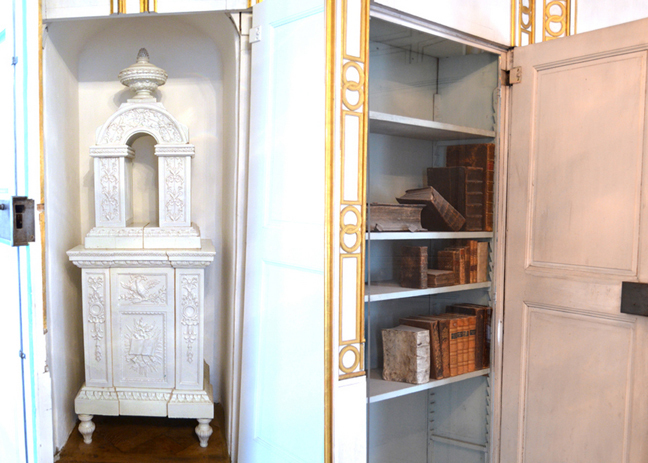 In 1734, Elector Karl Albrecht had it built for his wife Maria Amalia. 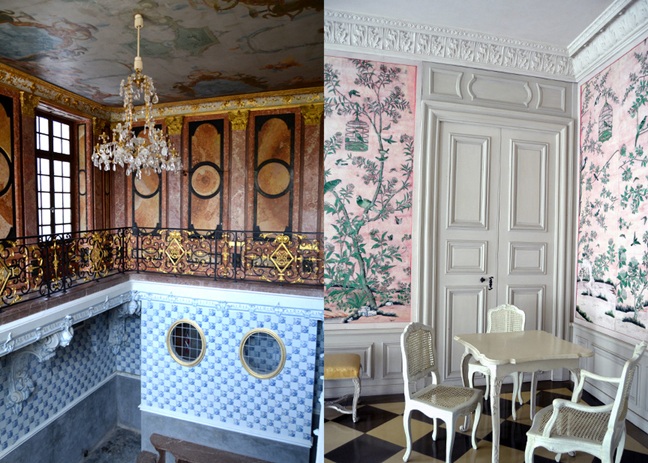 Amalienburg was also designed by Johann Baptist Zimmermann and François de Cuvilliés. 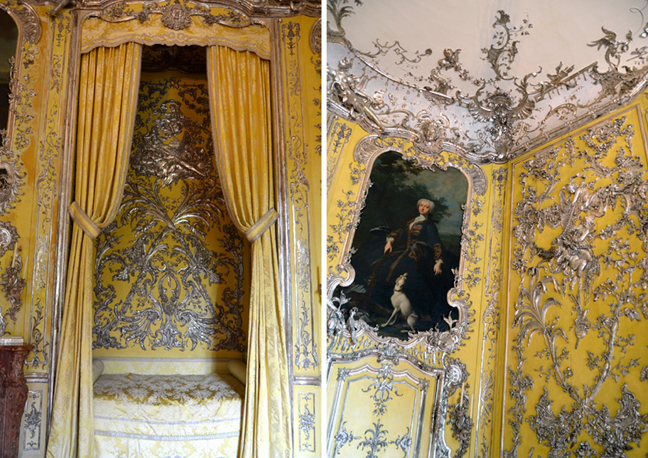 It's the most worthwhile of the four small "extra" palaces buried in the park. Can I get a "WOW!" The details and curlicues are immaculate. The tilework in the kitchen was stunning. I'm running out of descriptive words! A three-way fork in the road! Which way which way? I think we went straight and followed that couple. Worker's quarters? Hidden in the woods. I'd love the privacy. Then we walked to the Pagodenburg - a chinese-inspired pavilion. 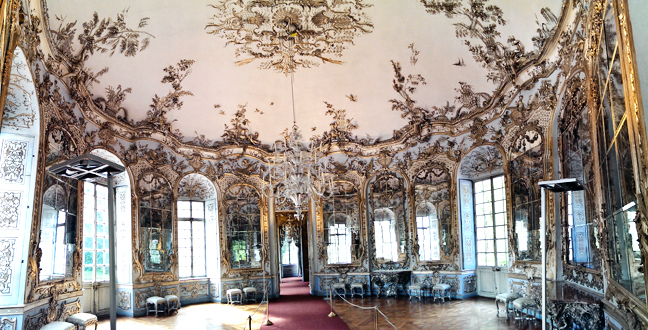 The first, main room is Rococo lushness. The rest of the palace definitely has the Chinese vibe! A swimming pool? There was no one to ask and everything was in German! I'm going with swimming pool. And the fanciest one I've ever seen! 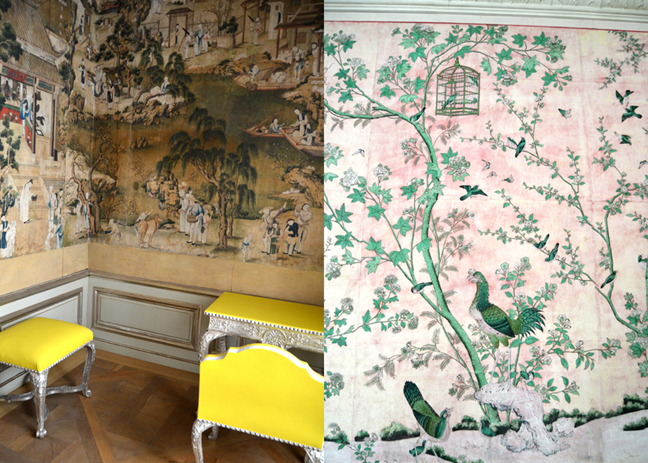 LOVE the neon yellow against the Chinese prints. So modern and fresh! Greenery as far as the eye could see! Back in the day when there was no internet and people would just WALK everywhere for FUN! 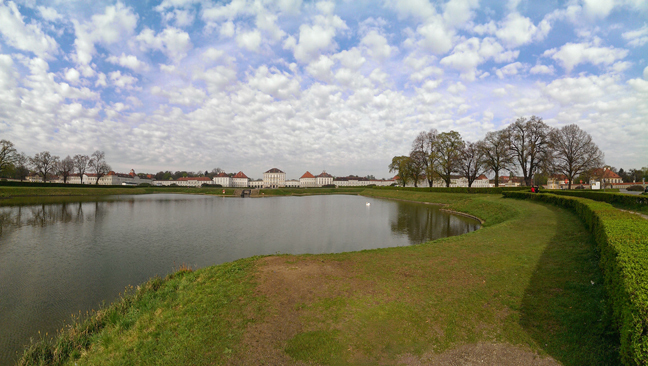 Temple across Badenburg Lake. The Cascade at the very end of the palace grounds. We made it! A view back to the palace - it's so far away it looks tiny! We had to run back to the car to make sure we met my parents on time. We missed seeing the other two palaces, but there's always a next time cuz it's pretty close by. 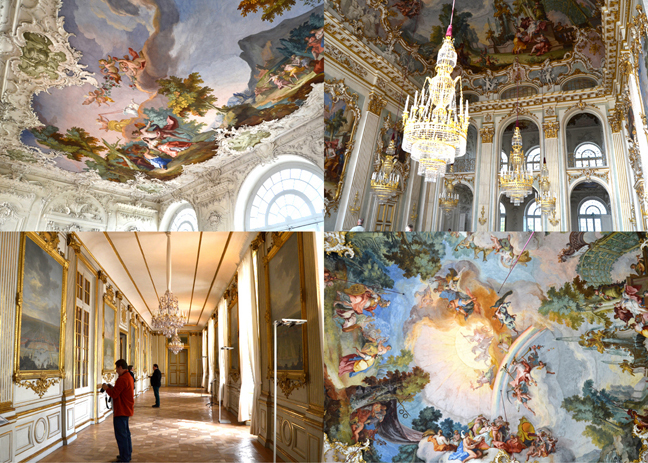 I think visiting palaces is my favorite thing to do here. 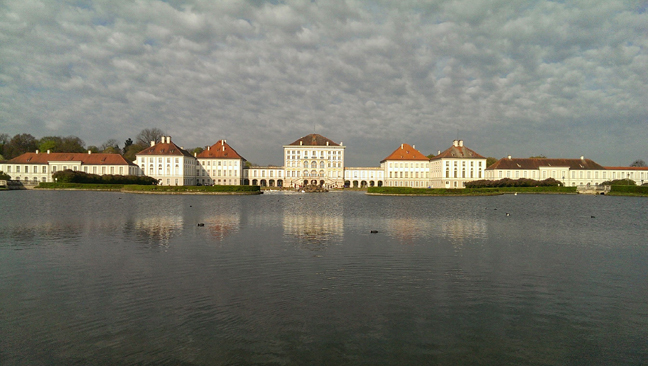 So long Nymphenburg - you are GORGEOUS! Aw, I've been telling you to go here forever! So happy you finally made it! 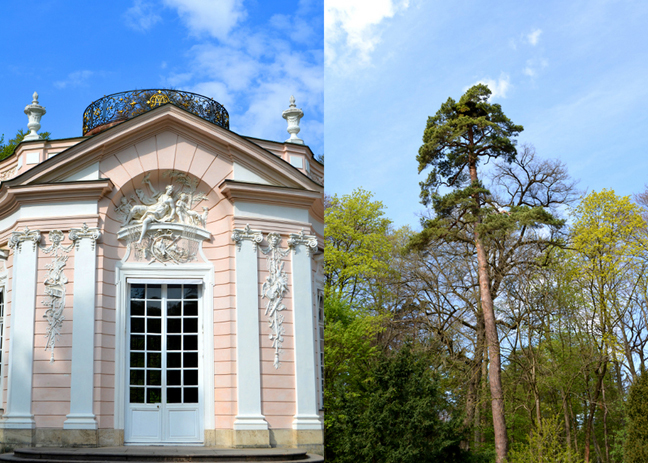 This was definitely the most gorgeous place I saw in Germany! So many paths lead you to so many hidden gems that they didn't even have marked! A definite must to go and visit again!! Hmmm. We saw the polar opposite where we went. I'm so glad you chose to go to this amazing place!!! *sigh* to live in those homes!! So gorgeous!! !